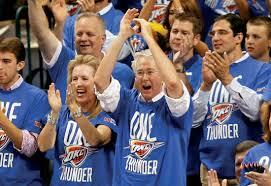 The picture was widely used before Aubrey McClendon’s death….one of him cheering on the Oklahoma City Thunder, the NBA team in which he had a 20 percent share. Now comes a report from the Wall Street Journal that before his death in March, the energy magnate mortgaged his share of the team. The story appeared in the Wednesday edition of the paper. “Even as Aubrey McClendon grappled with collapsing crude prices in the months before his unexpected death in March, the energy titan mortgaged his family’s stake in the Oklahoma City Thunder basketball team–to buy land. 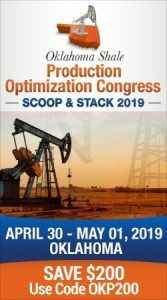 Now, that investment has paid off, with a small energy producer this month agreeing to buy for $136.5 million the roughly 18,000 acres that Mr. McClendon began snapping up in central Oklahoma last autumn, report Ryan Dezember and Kevin Helliker. To acquire the land, Mr. McClendon borrowed $85 million from Los Angeles investment firm Oaktree Capital Group LLC, pledging as collateral income generated by his share of the National Basketball Association’s Oklahoma City Thunder, Oklahoma land and court records show.